The Thomenator Says "I'll Be Back!" Let there be no mistake about the intentions of 40-Year-Old Jim Thome, who had a resurgent 2010 season - leading the Minnesota Twins into the playoffs – he wants to continue playing for “at least two more years.” The “Power Hitter From Peoria” currently has 589 career blasts, and stands just 11 home runs shy of the awesome 600 home run plateau. Considering that "The Thomenator" has averaged more than 27 dingers per year over the past five seasons (and a 40+ average during his 20 year career), he should join Ken Griffey, Jr. and Sammy Sosa as a member of the 600 Home Run Club® by the All-Star break! Big Jim enjoyed a spectacular resurgence last season, hitting 25 home runs in 276 at-bats and batting .283 with a 1.039 OPS. “Last year kind of revived me in a lot of different ways,” said the hulking but gentle giant. “Minnesota was a wonderful place to play, but it was a little different role for me. I didn't play every day and I came to grips with that. What it did for me was make me realize how much I still want to play, that passion I still have for the game. Rooney talked about how Thome “had a special experience in Minnesota” and “loves the manager,” but promised only that he would definitely consider going back to the Twins. 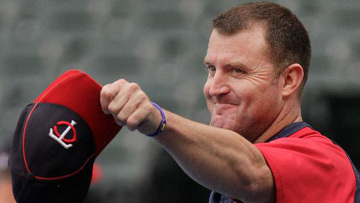 General Manager Bill Smith has made it very clear that his Minnesota club wants to re-sign Thome, but it has becoming obvious that he won’t be available at the same type of discount rate as last off- season. “He was a great fit for this ball club," said Twins GM Smith. "He was an impact bat, an impact in the clubhouse and an impact in the community. He's headed to the Hall of Fame. We were certainly glad to have him, and we'd love to have him back to round out his career with the Twins."